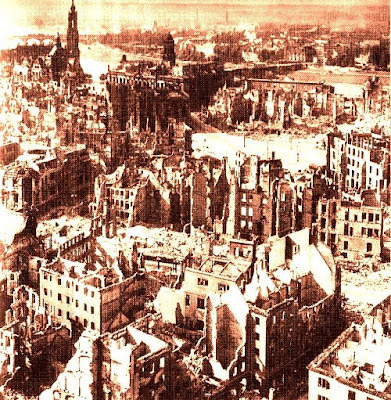 Rudolf Mauersberger composed his funeral motet Wie liegt die Stadt so wüst (How lonely sits the city) to a text from the Lamentations of Jeremiah in Dresden after the terrible bombing of the city (photo above) on February 13-14th, 1945. The photo below shows the first performance of the motet. This was given in the ruins of the Kreuzkirche in Dresden, where Mauersberger was cantor, on August 4th, 1945 . In the performance below Wie liegt die Stadt so wüst is sung by the Monteverdi Choir of Würzburg directed by Matthias Beckert. The first performance of the the motet in 1945 was given by the boys of Dresden's Kreuzchor who lost eleven of their number in the Allied bombing of the city. 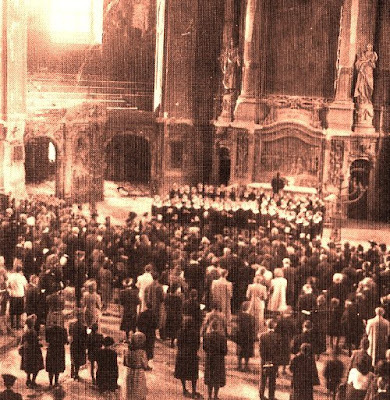 Now read about Rudolph Mauersberger's overlooked masterpiece that was inspired by this tragedy, his Dresden Requiem. Wie liegen die Steine des Heiligtums vorn auf allen Gassen zerstreut. der sich das ganze Land freuet? into my bones he made it descend. the joy of all the earth? Complete text is Lamentations of Jeremiah: 1, 1.4.13; 2, 15; 1,9; 5,17.20-21; 1,9. Now see Dresden risen from the ruins.